Ever since the Chop Cup was invented by magician Al Wheatley (whose stage name was Chop Chop, which is where the trick derives its unusual name) in the early 1950s, magicians have devised increasingly clever ways to use it. The basic one-cup one-ball approach to the classic Cups and Balls has held the fascination of magicians through the years, most probably due to its devious use of a mechanical principle along with sleight of hand to create an intriguing and compelling illusion. On this DVD, you'll meet some masters of the Chop Cup, each with their own spin on the trick. There are classicists such as John Mendoza, Danny Tong and Steve Dacri, who beguile their audiences with basic but still utterly baffling routines. Then we have rather unique approaches to the trick, such as David Regal, who substitutes the ball with - no kidding! - a toy mouse, and later, Gary Ouellet, who performs a beautifully choreographed (to music no less!) routine using a Chop Cup and a matching, ungaffed cup. Finally, we have Larry Jennings who created one of the most original (and most performed) Chop Cup routines ever. Finally, Jim Swain presents his own version of the Jennnings routine with his own singular imprint. 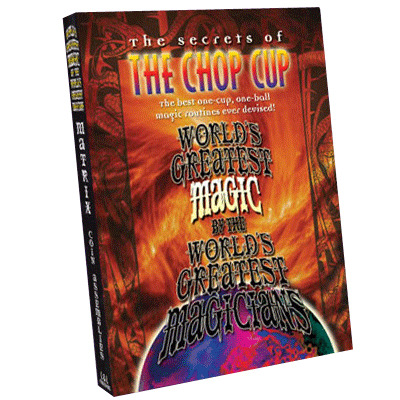 The Chop Cup has been a signature effect for many of magic's most successful performers, and on this DVD you'll find marvelous ready-made routines in addition to scores of ideas and stratagems to add to an existing routine. This benchmark collection features just about all of magic's most enduring and classic effects and routines. It's a fabulous compendium with many of the top masters in the world of magic teaching their handlings and routines for some of magic's classics. Linking rings, sponge balls, mental bending, cups and balls, thumb tips, Zombie, color-changing knives, and many, many more topics are all gathered in this one terrific video reference set. I purchased the download a while back, and I gotta say what I great buy. Has different styles of routines for just about any performer in my book. Learn a lot of great material and tips and tricks of this classic effect. If you haven't yet, add to cart!